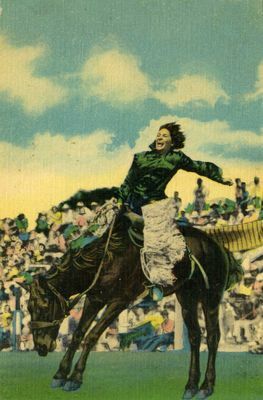 "Fifi on a Bucking Horse Postcard "
Color postcard of a woman riding on a bucking horse. From the papers of Mary Dawson, a dancer born in Philadelphia who became known in the entertainment world as Mademoiselle Fifi. Handwriting on the back of the postcard appears to say, "'Fifi' on bucking horse in Lubin's Moving Picture Field in 1914. (Valley Forge) PA - Betzwood estate, M'lle. Fifi, Mrs. Eddo Vasco Dawson. See life size oil painting in dancing pose of me."